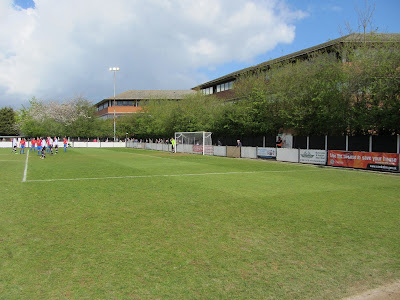 My thirteenth stadium of 2013 was on Saturday 27th April 2013 at Milton Road in Cambridge, Cambridgeshire. The match was Cambridge City vs. Redditch United in the Southern League Premier Division. Milton Road, also known as the City Ground, was located in the Chesterton area of the city, north of the city centre. 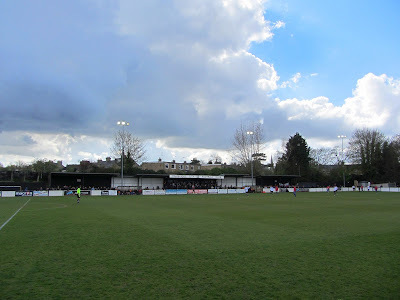 At just over 2 miles from Cambridge railway station it was the home of Cambridge City from 1922 until April 2013 with this game being the last at the venue. Though the club played at Milton Road for 91 years most of this was period was spent at a larger stadium than the one used in later years. During the mid-1980s part of the site was sold off for development and City moved back into a downsized version of Milton Road. The Main Stand was on the north-east side of the venue and consisted of two sections with the smaller part of the structure added more recently. 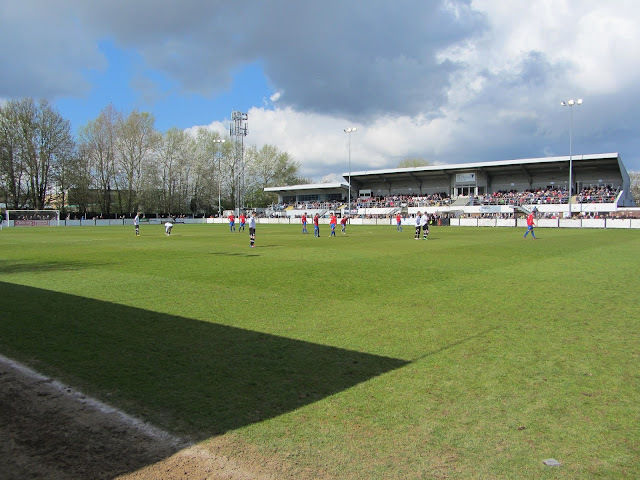 It was a covered all-seater stand with a capacity of 500. A hospitality area, clubhouse and player dressing rooms were contained within the Main Stand. On the opposite side of the pitch there was a covered terrace split into sections with the middle section taken by the most vocal home fans. The rest of this side of the ground was uncovered standing and it was the same story behind both of the goals although being quite narrow, these also doubled as walkways between the two main spectator areas on either side of the pitch. The game did not start well for the home side as they had to make two substitutions in the opening 12 minutes including one for a concussion to defender Lee Chaffey. Just a few minutes after this stoppage things got better for Cambridge as they took the lead. The ball was passed out wide to Ieuan Lewis who cut inside and took a shot which took a deflection of a defender. This carried it past two Cambridge players as well as the Redditch goalkeeper leaving Adrian Cambridge an easy tap-in from a couple of yards out. Redditch were limited to a couple of wayward long-range efforts in a half which had few other chances. Cambridge really should have extended their lead just after the break but their shooting was off-target and the Redditch goalkeeper not forced to make a save. The closest they got was an Adrian Cambridge volley from outside the box which fizzed just wide of the post. Redditch's best chance fell to George Washbourne who sprung free of the defence to get one-on-one with the goalkeeper. His shot bobbled wide and so the final game at Milton Road ended in victory for Cambridge City. 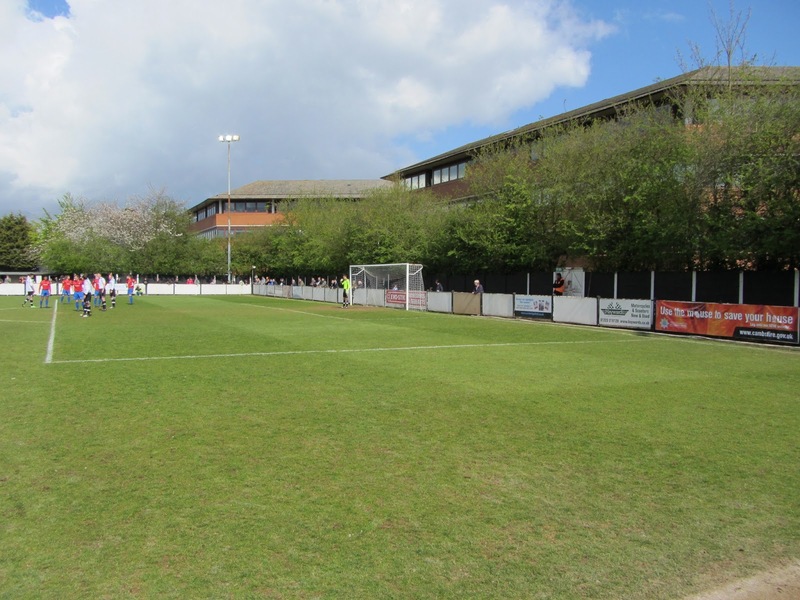 The club will groundshare with nearby Histon at their Bridge Road ground for the next few years with plans for Cambridge City to move into a new permanent home in Sawston after this.